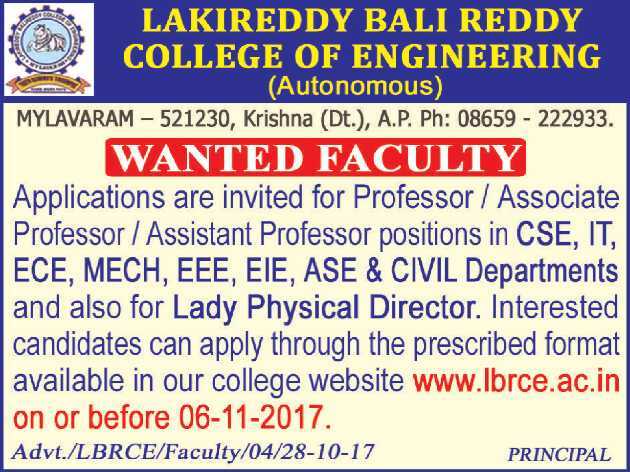 Lakireddy Bali Reddy College of Engineering, Krishna has advertised in THE HINDU newspaper for the recruitment of Professor / Associate Professor / Assistant Professor jobs vacancies. Interested and eligible job aspirants are requested to apply on or before 06th November 2016 Check out further more details below. About College: Lakireddy Balireddy College of Engineering is an ISO 9001:2008 Certified institution, approved by AICTE, Accredited by National Assesment and Accreditation Council (NAAC) with 'A' Grade and National Board of Accreditation (NBA). It has spacious campus spread over 60 acres, of serene and natural surroundings with plenty of greenery in Mylavaram, Krishna District.